James Gunn has returned to Twitter in order to help promote his latest movie, Brightburn. The filmmaker behind Marvel's Guardians of the Galaxy franchise has been largely absent from social media ever since he was fired from directing Guardians of the Galaxy Vol. 3 last summer. However, Marvel and Disney recently decided to rehire him as director of the project and that has resulted in Gunn making more of a return to the public eye, which has continued with this latest poster and trailer reveal. First up, James Gunn revealed a brand new poster for Brightburn, which has been positioned as an extremely dark take on a Superman-esque origin story. While they can't actually put it in the DC universe, it's essentially asking the question, what if that very same alien who crash-landed on Earth turned evil instead of a force for good? The creepy boy at the heart of this story is at the center of the poster, set against a blood red background. It's effectively creepy. Gunn had this to say in the caption he provided with the reveal. "Our hearts and hands are busted making this movie for you guys. Join us in watching it on Friday, May 24, in theaters everywhere." As for the trailer, it is a longer version of the previously released full-length trailer. It repackages a lot of the same footage we've seen in the past, but it certainly provides the most thorough look at the movie to date. It looks absolutely horrifying and doesn't skimp on the goods, in terms of set pieces and special effects. That said, it looks to be refreshingly smaller in scale, when compared to Marvel or DC movies. Think Chronicle, but not found footage and much darker. Brightburn comes from a script written by James' brother and cousin, Brian and Mark Gunn. David Yarovesky (The Hive) is in the director's chair. The movie was kept incredibly secretive all throughout production and, once the first trailer was revealed, it became clear why. The cast includes David Denman (Power Rangers, The Office), Jackson A. Dunn (Shameless, Glow), Matt Jones (Mom, Home) and Meredith Hagner (Set it Up, Younger), with Elizabeth Banks (Pitch Perfect, The LEGO Movie) also on board. Banks previously worked with Gunn on his horror movie Slither. James Gunn, for his part, is getting ready to shoot The Suicide Squad for DC, before he returns to the MCU to helm Guardians of the Galaxy Vol. 3. Does this mean we can expect to see more of Gunn on social media again in the future? He was rather active prior to some old, offensive tweets being dug up by conservative bloggers who disagreed with his vocal political views, which ultimately led to him being fired by Disney. We'll have to wait and see on that one. 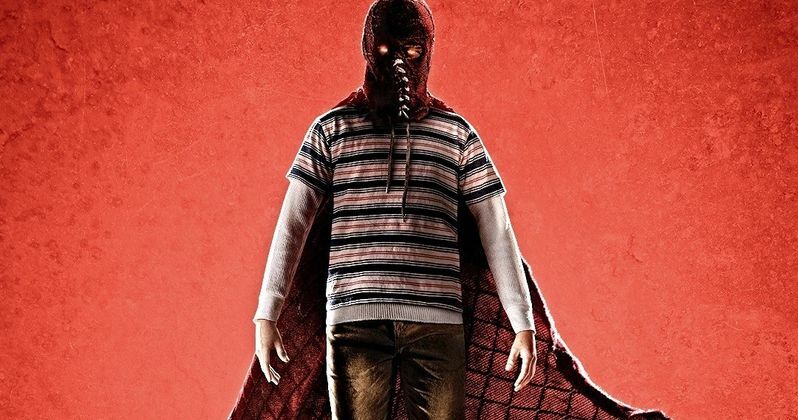 Brightburn is set to hit theaters on May 24. Be sure to check out the new trailer and poster from James Gunn's Twitter below.